We often gripe about having to drive into the city. It's often not a pleasant trip. I've done it for so long that it's pretty much a mindless drive. I turn on WDCB and head east. But yesterday was quite the scenic day. It made me glad that I always have my little camera on me and reminded me of why I love living here. We had drizzle all morning. The combination of a large body of water to the east and warmer air created an impressive fog bank. 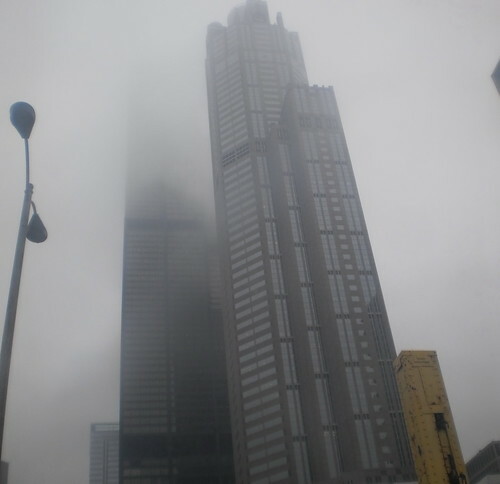 You get kind of used to seeing the skyscrapers of the skyline obliterated on cloudy days. It wasn't until I got into the downtown that I realized this was a different kind of cloudy. I forget the name of the building in the forefront. That's the Sears, oops, Willis, Tower in the background. The clouds and fog seem to wrap themselves, like a shawl, around the buildings. Almost anything of 10+ stories had fog wisps above the 10th floor. Jon and I headed to this job he's had for the past 4 years. 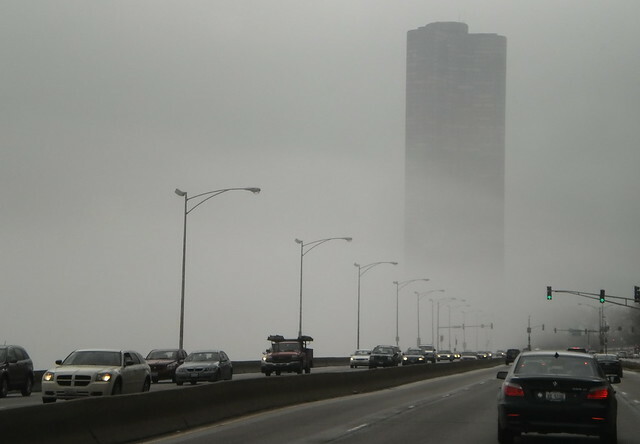 My photos going northbound on Lake Shore Drive are blurry and not very good. I think the combination of the gray and the drizzle just didn't lend themselves to through the windshield photography. My little camera has proven itself great for doing what I need it to do when I need it to do it. It's just that if I'm driving, I can't compensate for water on the windshield. Heading southbound on Lake Shore Drive after lunch, it was a different story. The drizzle had ended but the fog remained. It was so cool. Lake Shore Drive's "technical" speed limit is 45 but I don't know anyone who drives that. I could drive 50-55 while shooting photos and not get honked at. The north end of Michigan Avenue with the Hancock Center is just barely visible. I was across from the Lincoln Park Zoo when I took it, for those who know their Chicago. It's almost like they are ghosts of buildings, suggestions. They did become more visible as you got closer. The fog was still heavy but you could see the top of the Hancock in between cloud drifts. I think, however, this is the best photo to come from the drive. This is Lake Point Tower. It's a condo building that sits the farthest east off the near north side. Just south of it is the point where the Chicago River meets Lake Michigan. To the east of it is the lake and, what is wholly obscured here, Navy Pier. Lake Michigan is to my left, just concrete barriers away. This section of Lake Shore Drive is about as close as you'll get to the lake. I love how this is almost a black, white and gray photo. The only color is the red from the taillights of the car ahead of me and the almost imperceptible green traffic lights. 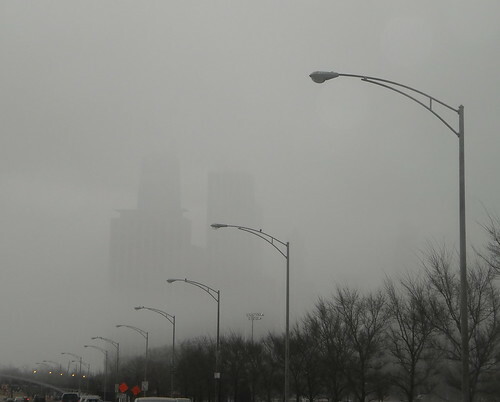 I love how the fog cuts the building off, making it ghostly and completely removes the park and buildings that are Navy Pier to the east. Lake Point Tower sits almost defiantly east of the Drive. It was damp and cold doing what I had to do, but when I get photos like this, accidentally, really, it makes the drive in worth it. I know I have quoted this poem by Carl Sandberg before. Yes, this was his inspiration.